With the demand for landscaping services increasing, the growth potential for a new company in this field is high. But, before launching landscaping companies, make sure that their names are perfect and spell out their personality and message. Landscapers are responsible for making a piece of land look beautiful and presentable. This business has expanded into almost all the sectors where there is a need to maintain the land in an appealing and healthy condition. Today, affluent individuals and families are the permanent clients of landscaping companies. But government properties, private companies, sports fields, and others need these services on a regular basis to maintain a good land outlook. Landscaping services have been registering a steady growth from 2013 onwards. The profitability in this sector has increased by 50%. However, since many small and big companies are active in this business in any given region, your new venture is going to face fierce competition. To deal with the competition and to drive customer attention toward your new company, its unique and simple name is the key. If the name is catchy and is capable of representing your brand, it helps in giving your new business a head start. Today’s landscaping business is all about delivering specialized services. Since almost all sectors need to maintain an impressive look of the surrounding lands, they look for the companies that have experience in working in that landscaping niche. So, make sure that when hearing or seeing your company name, they know what your landscaping expertise is. For example, do you landscape for children or you do the job for aqua park or medical institutions? Of, it may be that your company intends to target project builders and so on. When a niche finds its mention in a company name, you do not have to do other marketing to educate people about what exactly you do. Your landscaping logo design will promote your business with such a name. Then, have a good look at their company names. Do not pick any name that sounds similar or has the same words. Whenever you think of a name, make sure that it has no connection with your competitor business names. But you need to study those names and analyze what makes them click. Do not forget that to establish a brand identity of your business; you need to look different in so many ways including your unique name of the company. An aspiring business owner dreams of making it big. A professionally run company makes plans to venture into bigger markets. With time, landscaping companies add new equipment and services to serve a different set of clients. This means that your company name should still be relevant after decades when your business expands into new markets. For example, if your company name has your town name, you will change it after you start landscaping services in other towns. Not only that, but you will also redesign your lawn care logo if it has a name that limits your business. How about putting your own name? That is very tempting for many company owners. That is also a way to make the company name stand out. However, use your name only when it is impressive and leaves a good impression when used as a business name. Not all individual names make a good business name. Therefore, think of using your name only when it is unique and different. You can then ask a professional graphic designer to incorporate your name into your company’s logo so that it becomes a marketing tool. This old advice of keeping it simple also applies to name a business. If people are not familiar with the words and sounds used in the name, they may not like your company. But a simple name that they can pronounce easily will linger in their memory. They can use the name when chatting with their peers personally or on social media. Keep the name short rather than making it too long. A short name is also easily memorable, and it can be typed quickly for a Google search when customers want to visit your website for more information. A sweet and short name for your landscaping business is, therefore, advisable. Brainstorming with your some friends or members of your company can help in coming out with some exciting name ideas. Just chat around with your people over some names you have in mind. Ask them to speak their mind on the names that emerge during the session. Landscaping companies are brands. A brand is about the perception the customers have about a company’s products or services. Your new company should make efforts to build positive thinking about the services you deliver. The perception could be regarding the quality of services, equipment, professional dealing of customers, and so on. Hundreds of businesses get trademark registration daily. In your landscaping niche, trademark registration of names and logo design are acquired regularly. So, the name you thought to be perfect may be registered as a business name already. The government authorities do not accept even similar sounding names for the registration. Therefore, check with the authorities if the name can be registered or someone has grabbed it. Before you look for graphic design ideas to create your stunning website for a landscaping business, better find out if the company name is available as your domain address. This is also your URL for putting your business online. But if the exact name is not available, try if you can get it in its variants. Moreover, in case the most sought-after .com domain is not obtainable, think of other domains such as .net or .biz. These are also equally good addresses for your online landscaping businesses. You should visit sites such as GoDaddy.com to check if the name is accessible as a domain for your company and business. As you are too close to the naming process, sometimes you may be preoccupied with a name that you liked so much. But if you take people’s opinion on a short list of the names you got after brainstorming sessions, it gives you some inkling of how your target customers may respond. 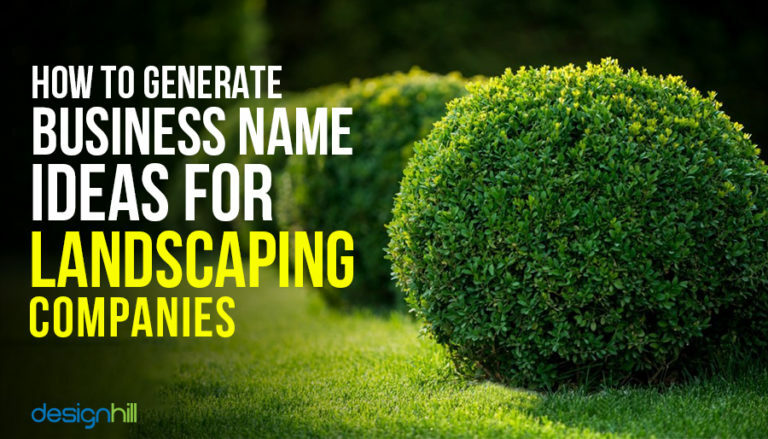 So, these tips should keep you on the right path when naming landscaping companies. But you need to invest a lot of time as it may take days before you arrive at the right company name that fits well in your brand personality. Once the name is in place, the next step is to market your new business aggressively. For that, you need to create identities such as your logo, business card, brochure, website, mobile apps, and many others. In fact, you will need a lot of visuals for business promotion. At that time, Designhill the platform that offers you new design solutions to create these identities of your landscaping business. For a small business with limited budget, this marketplace is ideal to get dozens of design ideas at affordable prices. Landscaping companies should be named appropriately so that target customers can notice it. So, it should be a simple but unique name that stands out in a niche landscaping market. But its availability for trademark registration and as a domain name is also an issue. With the right feedback, you can surely name your business correctly.